Kanye Omari West (/ˈkɑːnjeɪ/; born Juin 8, 1977) is an American rapper, sangster, sangwriter, record producer, entrepreneur an fashion designer. 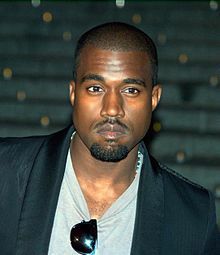 ↑ "Kanye West Net Worth: Is the Rapper Still in Debt as He and Kim Welcome 3rd Baby?". January 13, 2018. Wikimedia Commons haes media relatit tae Kanye West. This page wis last eeditit on 1 August 2018, at 21:27.